Louisiana’s legislature responded to the community outcry for change by passing the Juvenile Justice Reform Act of 2003 (“Act 1225”) and House Concurrent Resolution 56. These acts provide a long-term blueprint for reforming and restructuring the juvenile and education systems. Roughly 56% of African American youth in the juvenile justice system report a prior school suspension. Forty percent of Louisiana’s youth are locked up for nonviolent offenses. Many of these children drop-out of school eventually carrying heavy individual cost while placing significant burdens on society. In the alternative, leading economists have estimated that increasing high school graduation rates would decrease violent crime by 20%, and property crime by 10%. Keeping these statistics in mind, we ask, school or prison – which would you want for your child? At present, there is nothing in state law that protects the rights of children or prevents school boards from putting young students out of school for minor and subjective disciplinary reasons. The current practices of school boards across the state and the current state law related to suspensions and expulsions do not align with the goal of the Louisiana State Constitution which states: “The goal of the public education system is to provide learning environments and experiences, at all stages of human development, that are humane, just, and designed to promote excellence in order that every individual may be afforded an equal opportunity to develop to his full potential.”- Preamble to Article 8 of the Louisiana State Constitution. Thus our campaign: 50/2017: Building a Movement to Stop the School to Prison Pipeline! FFLIC believes in action and involving parents in each and every step of the processes which affects their children’s lives, honoring the struggle of those most impacted. A child born into a low-income family will not be protected from the effects of cruel and uncaring systems if the parent, the number one line of defense for any child, is not involved. Parents who feel knowledgeable and capable make stronger and more consistent advocates and children are less likely to be mistreated or removed from schools. Unfortunately, many families in the juvenile INjustice system find themselves the targets of blame, depicted in society and media as “lazy, dysfunctional parents.” They feel isolated by shame and lost in the maze of school discipline proceedings that outright exclude them or are dominated by system jargon and legalese. Rather than taking advantage of family strengths, school and the juvenile justice systems unwittingly alienate the very people who have the strongest incentive to work toward positive outcomes for their children. They have the greatest influence in the lives of their children, and an ongoing commitment to these youth well after school, juvenile justice and other agency involvement. 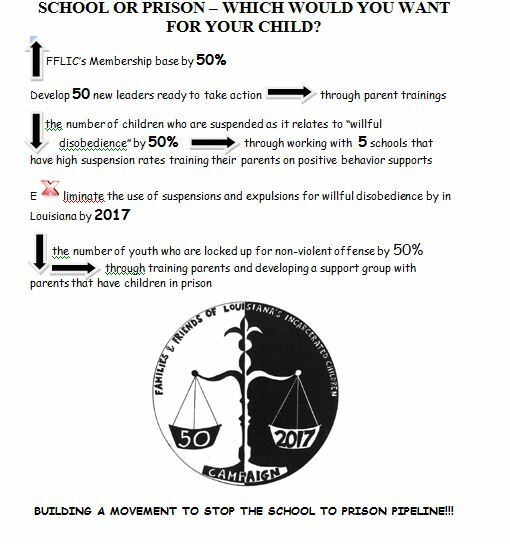 FFLIC’s stopping the School to Prison Pipeline Campaign will train parents to advocate for their children and develop effective leaders, create safe schools for all of Louisiana’s children by keeping kids off the streets, out of the juvenile justice system and in school where they belong. FFLIC’s 50/2017 campaign has identified and is now challenging the policies that are pushing our children out of school and hastening their entry into the juvenile–and eventually the criminal–justice system. FFLIC’s 50/2017 campaign is dedicated to fighting the historical inequalities, concentrated poverty, racial disparities in discipline, and segregated education that is leading to push-out. We want to ensure that every child who enrolls in school graduates with a high school diploma and lives up to their fullest potential instead of being ushered into the prison system. 1. I agree that there is a school to prison pipeline. FFLIC defines the School to Prison Pipeline as the systematic and institutional approach to depriving poor people of color a right to an equitable and quality education by pushing kids out of school through unjust suspension and expulsions, high-stakes testing, the lack of educational resources on a consistent basis, denial of special education services, lowered expectations, zero tolerance policies, and mentally preparing kids for prison by creating prison like environments in the schools with the overuse of police and security guards policing students. 2. I believe that families and youth are a vital part to developing solutions to stopping the school to prison pipeline and the overuse of youth incarceration and they want to and should be a part of the process and I commit to working with them. In the recent report released by Justice for Families: Families Unlocking Futures: Solutions to the crisis on Juvenile Justice parents state: “We love our children, want what is best for them, and want to be directly involved in their care and treatment. The vast majority of parents and family members—more than 85 percent of us—said that we want to be more involved in decisions about our children’s care, and in the treatment and counsel­ing process. The barriers families face as they try to support their children defy common sense, shared values, and years of research. Numerous studies have identified common elements to effective youth justice programs. These elements include treatment at home or in a home-like setting, and treatment built around youth and family strengths”. 3. I agree that we should not suspend youth for minor subjective infractions such as “willful disobedience” and that children should be kept in school learning. Dignity in Schools Campaign in a Model Code on Education and Dignity states that:” Each year, over 3 million students across the country are suspended and over 100,000 are expelled. Perversely, these punitive practices do not improve student behavior, but rather increase the likelihood that students will fall behind academically and dropout, contributing to an unhealthy atmosphere affecting the entire school community. With suspension and expulsion rates at all-time highs, a failure to address and improve current disciplinary practices stymies national efforts to reduce the dropout rate, close the achievement gap and improve teacher effectiveness”. 4. I agree that non-violent youth should not be held in prison, instead are placed in community based alternative settings. The Annie E. Casey – No Place for Kids reports: that incarceration wastes taxpayer dollars: Nationwide, states continue to spend the bulk of their juvenile justice budgets – $5 billion in 2008 – to confine and house young offenders in incarceration facilities despite evidence showing that alternative in-home or community-based programs can deliver equal or better results for a fraction of the cost. Louisiana Department of Education (2010). Discipline Actions and Ethnicity by Reason Code. M.E. Goertz, et al., “Who drops out of high school and why? : Findingsfrom a national study,” Teachers College Record, 87, 357-73, www.tcrecord. org/Content.asp?ContentId=688. Henry Levin and Clive Belfield, “The Cost and Benefits of An Excellent Education,” 2007, http://www.cbcse.org/modules/download_gallery/dl.php?file=35. Why is this issue important to you and your community?